SOCIAL DEMOCRATS LEADER Catherine Murphy has said the party eschewed the Right2Change policy platform and voting pact because parts of it “read like a manifesto”. Murphy told RTÉ’s Morning Ireland that the pact, entered into by Sinn Féin this week, did not suit the party founded by herself and fellow party leaders Róisín Shortall and Stephen Donnelly. There has been a luke-warm response to the document and Sinn Féin’s call for a voting pact with left-wing parties and independents. 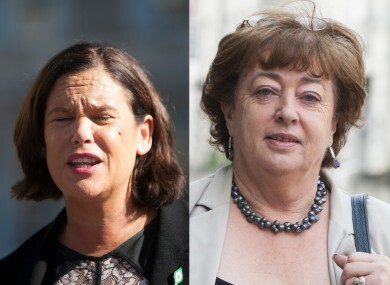 A number of prominent independent TDs, including Donegal-based Thomas Pringle and Roscommon-based Michael Fitzmaurice, have said they would not ask voters to give their second preferences to Sinn Féin candidates. Murphy said that while she agreed with Sinn Féin on water and early childhood education, parts of the document read “more like a manifesto”. “The vast majority of what is in their document we would support but it is not just a set of policy principles. “For example, under the section on housing it looks to socialise unused or derelict sites and we are not sure if that is constitutional. And elsewhere where we accept natural resources belong to the people of Ireland, this document looks to recover money where there has been natural resources exploited by private entities. “We don’t think that is feasible,” she added. The Right2Change document‘s proposals include the abolition of water charges, changes to EU fiscal rules, the elimination of the deficit by 2020, prioritising social and economic investment including doubling public investment and higher taxes on wealth. Other parties and interested candidates have until today to sign up to the document. Email “The SocDems have ruled out an election pact with Sinn Féin”. Feedback on “The SocDems have ruled out an election pact with Sinn Féin”.